APIDRA is a sterile, aqueous, clear, and colorless solution. Each milliliter of APIDRA (insulin glulisine injection) contains 100 IU (3.49 mg) insulin glulisine, 3.15 mg m-cresol, 6 mg tromethamine, 5 mg sodium chloride, 0.01 mg polysorbate 20, and water for injection. APIDRA has a pH of approximately 7.3. The pH is adjusted by addition of aqueous solutions of hydrochloric acid and/or sodium hydroxide. The primary activity of insulins and insulin analogs, including insulin glulisine, is regulation of glucose metabolism. Insulins lower blood glucose levels by stimulating peripheral glucose uptake by skeletal muscle and fat, and by inhibiting hepatic glucose production. Insulins inhibit lipolysis in the adipocyte, inhibit proteolysis, and enhance protein synthesis. The glucose lowering activities of APIDRA and of regular human insulin are equipotent when administered by the intravenous route. After subcutaneous administration, the effect of APIDRA is more rapid in onset and of shorter duration compared to regular human insulin. Pharmacokinetic profiles in healthy volunteers and patients with diabetes (type 1 or type 2) demonstrated that absorption of insulin glulisine was faster than regular human insulin. In a euglycemic clamp study in patients with type 2 diabetes (n=24) with a body mass index (BMI) between 20 to 36 kg/m 2 after subcutaneous administration of 0.2 IU/kg, the median time to maximum concentration (T max ) was 89 minutes (range 74 to 103 minutes) and the median peak concentration (C max ) was 81 µIU/mL (range 75 to 112 µIU/mL) for insulin glulisine compared to a median T max of 94 minutes (range 55 to 140 minutes) and a median C max of 39 µIU/mL (range 30 to 56 µIU/mL) for regular human insulin. 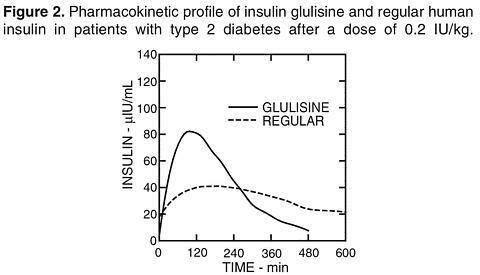 The mean residence time of insulin glulisine was shorter (median: 154 minutes, range 122 to 174 minutes) than for regular human insulin (median: 280 minutes, range 227 to 294 minutes). In a euglycemic clamp study in obese, non-diabetic subjects (n=18) with a body mass index (BMI) between 30 to 40 kg/m 2 after subcutaneous administration of 0.3 IU/kg, the median time to maximum concentration (T max ) was 76 minutes (range 51 to 118 minutes) and the median peak concentration (C max ) was 199 µIU/mL (range 99 to 387 µIU/mL) for insulin glulisine compared to a median T max of 144 minutes (range 110 to 207 minutes) and a median C max of 79 µIU/mL (range 39 to 166 µIU/mL) for regular human insulin. 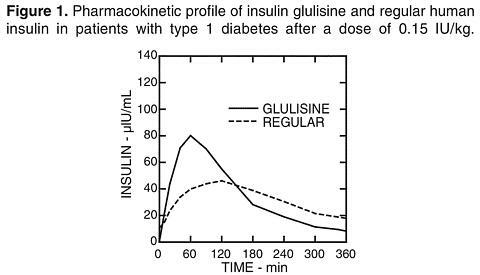 The mean residence time of insulin glulisine was shorter (median: 141 minutes, range 105 to 210 minutes) than for regular human insulin (median: 226 minutes, range 188 to 293 minutes). When APIDRA was injected subcutaneously into different areas of the body, the time-concentration profiles were similar. The absolute bioavailability of insulin glulisine after subcutaneous administration is about 70%, regardless of injection area (abdomen 73%, deltoid 71%, thigh 68%). The distribution and elimination of insulin glulisine and regular human insulin after intravenous administration are similar with volumes of distribution of 13 L and 21 L and half-lives of 13 and 17 minutes, respectively. After subcutaneous administration, insulin glulisine is eliminated more rapidly than regular human insulin with an apparent half-life of 42 minutes compared to 86 minutes. The maximum blood glucose excursion ((DELTA)GLU max ; baseline subtracted glucose concentration) for APIDRA injected 2 minutes before meal was 65 mg/dL compared to 64 mg/dL for regular human insulin injected 30 minutes before meal (see Figure 3A), and 84 mg.h/dL for regular human insulin injected 2 minutes before meal (see Figure 3B). 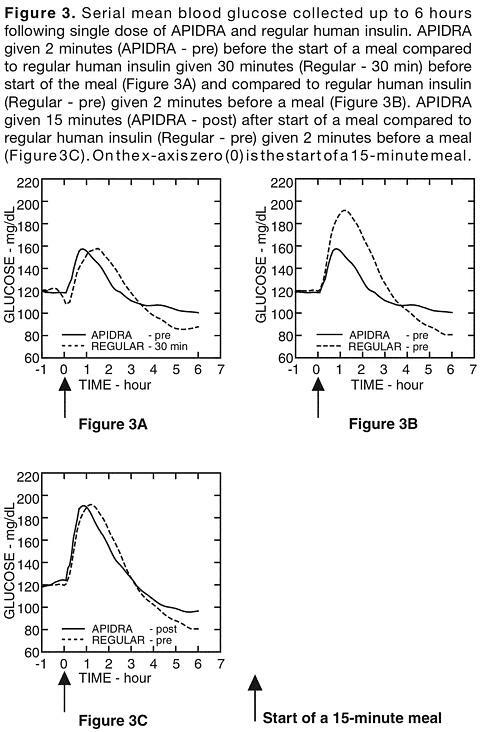 The maximum blood glucose excursion for APIDRA injected 15 minutes after the start of a meal was 85 mg/dL compared to 84 mg.h/dL for regular human insulin injected 2 minutes before meal (see Figure 3C). The pharmacokinetic and pharmacodynamic properties of APIDRA and regular human insulin were assessed in a study conducted in pediatric patients with type 1 diabetes (children [7 to 11 years, n = 10] and adolescents [12 to 16 years, n = 10]). The relative differences in pharmacokinetics and pharmacodynamics between APIDRA and regular human insulin in pediatric patients with type 1 diabetes were similar to those in healthy adult subjects and adults with type 1 diabetes. Information on the effect of gender on the pharmacokinetics of APIDRA is not available. A study was performed in 24 healthy Caucasians and Japanese to compare the pharmacokinetic and pharmacodynamic parameters after subcutaneous injection of insulin glulisine, insulin lispro, and regular human insulin. With subcutaneous injection of insulin glulisine, Japanese subjects had a greater initial exposure (33%) for the ratio of AUC(0-1hr) to AUC (0-clamp end) than that in Caucasians (21%) though the total exposures were similar. Similar findings were observed with insulin lispro and regular human insulin for the racial difference. The safety and efficacy of APIDRA was studied in adult patients with type 1 and type 2 diabetes (n=1833). The primary efficacy parameter was glycemic control, as measured by glycated hemoglobin (GHb), and expressed as hemoglobin A1c equivalents (HbA1c). * Adj. mean change from baseline treatment difference (98.33% CI for treatment difference): APIDRA pre meal vs. Regular Human Insulin - 0.13 (-0.26; 0.01); APIDRA post meal vs. Regular Human Insulin 0.02 (-0.11; 0.16); APIDRA post meal vs. pre meal 0.15 (0.02; 0.29). To evaluate the use of APIDRA for administration using an external pump, a 12-week randomized, active control study (APIDRA versus insulin aspart) was conducted in patients with type 1 diabetes (APIDRA n=29, insulin aspart n=30). All patients were Caucasian. The mean age was 45.8 (range 21-73 years). Glycemic control (mean HbA1c value at endpoint 6.98% with APIDRA and 7.18% with insulin aspart) and the rates of hypoglycemia requiring intervention from a third party were comparable for the two treatment regimens. APIDRA is indicated for the treatment of adult patients with diabetes mellitus for the control of hyperglycemia. APIDRA is contraindicated during episodes of hypoglycemia and in patients hypersensitive to APIDRA or one of its excipients. APIDRA differs from regular human insulin by its rapid onset of action and shorter duration of action. When used as a meal time insulin, the dose of APIDRA should be given within 15 minutes before or immediately after a meal. Because of the short duration of action of APIDRA, patients with diabetes also require a longer-acting insulin or insulin infusion pump therapy to maintain adequate glucose control. Any change of insulin should be made cautiously and only under medical supervision. Changes in insulin strength, manufacturer, type (e.g., regular, NPH, analogs), or species (animal, human) may result in the need for a change in dose. Concomitant oral antidiabetic treatment may need to be adjusted. Hypoglycemia is the most common adverse effect of insulin therapy, including APIDRA. The timing of hypoglycemia may differ among various insulin formulations. As with all insulin preparations, the time course of APIDRA action may vary in different individuals or at different times in the same individual and is dependent on site of injection, blood supply, temperature, and physical activity. Insulin requirements may be altered during intercurrent conditions such as illness, emotional disturbances, or stress. Such situations may result in severe hypoglycemia (and, possibly, loss of consciousness) prior to patients' awareness of hypoglycemia. As with other insulin therapy, patients may experience redness, swelling, or itching at the site of injection. These minor reactions usually resolve in a few days to a few weeks. In some instances, these reactions may be related to factors other than insulin, such as irritants in a skin cleansing agent or poor injection technique. Less common, but potentially more serious, is generalized allergy to insulin, which may cause rash (including pruritus) over the whole body, shortness of breath, wheezing, reduction in blood pressure, rapid pulse, or sweating. Severe cases of generalized allergy, including anaphylactic reactions, may be life threatening. In controlled clinical trials up to 12 months, potential systemic allergic reactions were reported in 79 of 1833 patients (4.3%) who received APIDRA and 58 of 1524 patients (3.8%) who received the comparator short-acting insulins. During these trials treatment with APIDRA was permanently discontinued in 1 of 1833 patients due to a potential systemic allergic reaction. Localized reactions and generalized myalgias have been reported with the use of cresol as an injectable excipient. As with any insulin therapy, lipodystrophy may occur at the injection site and delay insulin absorption. In a study in patients with type 1 diabetes (n=333), the concentrations of insulin antibodies that react with both human insulin and insulin glulisine (cross-reactive insulin antibodies) remained near baseline during the first 6 months of the study in the patients treated with APIDRA. A decrease in antibody concentration was observed during the following 6 months of the study. In a study in patients with type 2 diabetes (n=411), a similar increase in cross-reactive insulin antibody concentration was observed in the patients treated with APIDRA and in the patients treated with human insulin during the first 9 months of the study. Thereafter the concentration of antibodies decreased in the APIDRA patients and remained stable in the human insulin patients. There was no correlation between cross-reactive insulin antibody concentration and changes in HbA1c, insulin doses, or incidences of hypoglycemia. APIDRA has been studied in the following pumps and infusion sets: Disetronic ® H-Tron ® plus V100 and D-Tron ® with Disetronic catheters (Rapid, Rapid C, Rapid D, and Tender); MiniMed ® Models 506, 507, 507c and 508 with MiniMed catheters (Sof-set Ultimate QR, and Quick-set) **/** . Patients should be instructed on self-management procedures including glucose monitoring, proper injection technique, and hypoglycemia and hyperglycemia management. Patients must be instructed on handling of special situations such as intercurrent conditions (illness, stress, or emotional disturbances), an inadequate or skipped insulin dose, inadvertent administration of an increased insulin dose, inadequate food intake, or skipped meals. Refer patients to the APIDRA Patient Information Leaflet for additional information. Patients using external pump infusion therapy should be trained appropriately. APIDRA has been studied in the following pumps and infusion sets: Disetronic H-Tron plus V100 and D-Tron with Disetronic catheters (Rapid, Rapid C, Rapid D, and Tender); MiniMed Models 506, 507, 507c and 508 with MiniMed catheters (Sof-set Ultimate QR, and Quick-set). To minimize insulin degradation, infusion set occlusion, and loss of the preservative (m-cresol), the infusion sets (reservoir, tubing, and catheter) and the APIDRA in the reservoir should be replaced every 48 hours or less and a new infusion site should be selected. The temperature of the insulin may exceed ambient temperature when the pump housing, cover, tubing or sport case is exposed to sunlight or radiant heat. Insulin exposed to temperatures higher than 98.6°F (37°C) should be discarded. Infusion sites that are erythematous, pruritic, or thickened should be reported to the healthcare professional, and a new site selected because continued infusion may increase the skin reaction and/or alter the absorption of APIDRA. The following are examples of substances that may reduce the blood-glucose-lowering effect of insulin: corticosteroids, danazol, diazoxide, diuretics, sympathomimetic agents (e.g., epinephrine, albuterol, terbutaline), glucagon, isoniazid, phenothiazine derivatives, somatropin, thyroid hormones, estrogens, progestogens (e.g., in oral contraceptives), protease inhibitors, and atypical antipsychotic medications (e.g., olanzepine and clozapine). The following are examples of substances that may increase the blood-glucose-lowering effect and susceptibility to hypoglycemia: oral antidiabetic products, ACE inhibitors, disopyramide, fibrates, fluoxetine, MAO inhibitors, pentoxifylline, propoxyphene, salicylates, sulfonamide antibiotics. In addition, under the influence of sympatholytic medicinal products such as beta-blockers, clonidine, guanethidine, and reserpine, the signs of hypoglycemia may be reduced or absent. In a clinical study in healthy volunteers (n=32) the total insulin glulisine bioavailability was similar after subcutaneous injection of insulin glulisine and NPH insulin (premixed in the syringe) and following separate simultaneous subcutaneous injections. There was some attenuation (27%) of the maximum concentration (C max ) after premixing, however the time to maximum concentration (T max ) was not affected. If APIDRA is mixed with NPH human insulin, APIDRA should be drawn into the syringe first. Injection should be made immediately after mixing. No data are available on mixing APIDRA with insulin preparations other than NPH. (See CLINICAL STUDIES .) APIDRA should not be mixed with insulin preparations other than NPH. Mixtures should not be administered intravenously. The effects of mixing APIDRA with diluents or other insulins when used in external subcutaneous infusion pumps for insulin have not been studied. Therefore, APIDRA should not be mixed in these instances. Standard 2-year carcinogenicity studies in animals have not been performed. In Sprague Dawley rats, a 12-month repeat dose toxicity study was conducted with insulin glulisine at subcutaneous doses of 2.5, 5, 20 or 50 IU/kg twice daily (dose resulting in an exposure 1, 2, 8, and 20 times the average human dose, based on body surface area comparison). There was a non-dose dependent higher incidence of mammary gland tumors in female rats administered insulin glulisine compared to untreated controls. The incidence of mammary tumors for insulin glulisine and regular human insulin was similar. The relevance of these findings to humans is not known. Insulin glulisine was not mutagenic in the following tests: Ames test, in vitro mammalian chromosome aberration test in V79 Chinese hamster cells, and in vivo mammalian erythrocyte micronucleus test in rats. In fertility studies in male and female rats at subcutaneous doses up to 10 IU/kg once daily (dose resulting in an exposure 2 times the average human dose, based on body surface area comparison), no clear adverse effects on male and female fertility, or general reproductive performance of animals were observed. Reproduction and teratology studies have been performed with insulin glulisine in rats and rabbits using regular human insulin as a comparator. The drug was given to female rats throughout pregnancy at subcutaneous doses up to 10 IU/kg once daily (dose resulting in an exposure 2 times the average human dose, based on body surface area comparison). Insulin glulisine did not have any remarkable toxic effects on the embryo-fetal development in rats. The drug was given to female rabbits throughout pregnancy at subcutaneous doses up to 1.5 IU/kg/day (dose resulting in an exposure 0.5 times the average human dose, based on body surface area comparison). Adverse effects on embryo-fetal development were only seen at maternal toxic dose levels inducing hypoglycemia. Increased incidence of post-implantation losses and skeletal defects were observed at a dose level of 1.5 IU/kg once daily (dose resulting in an exposure 0.5 times the average human dose, based on body surface area comparison) that also caused mortality in dams. A slight increased incidence of post-implantation losses was seen at the next lower dose level of 0.5 IU/kg once daily (dose resulting in an exposure 0.2 times the average human dose, based on body surface area comparison) which was also associated with severe hypoglycemia but there were no defects at that dose. No effects were observed in rabbits at a dose of 0.25 IU/kg once daily (dose resulting in an exposure 0.1 times the average human dose, based on body surface area comparison). The effects of insulin glulisine did not differ from those observed with subcutaneous regular human insulin at the same doses and were attributed to secondary effects of maternal hypoglycemia. There are no well-controlled clinical studies of the use of insulin glulisine in pregnant women. Because animal reproduction studies are not always predictive of human response, this drug should be used during pregnancy only if the potential benefit justifies the potential risk to the fetus. It is essential for patients with diabetes or a history of gestational diabetes to maintain good metabolic control before conception and throughout pregnancy. Insulin requirements may decrease during the first trimester, generally increase during the second and third trimesters, and rapidly decline after delivery. Careful monitoring of glucose control is essential in such patients. It is unknown whether insulin glulisine is excreted in human milk. Many drugs, including human insulin, are excreted in human milk. For this reason, caution should be exercised when APIDRA is administered to a nursing woman. Patients with diabetes who are lactating may require adjustments in APIDRA dose, meal plan, or both. Safety and effectiveness of APIDRA in pediatric patients have not been established. In Phase III clinical trials (n=2408), APIDRA was administered to 147 patients >/=65 years of age and 27 patients >/=75 years of age. The majority of these were patients with type 2 diabetes. The change in HbA1c values and hypoglycemia frequencies did not differ by age, but greater sensitivity of some older individuals cannot be ruled out. Overall, clinical studies comparing APIDRA with short-acting insulins did not demonstrate a difference in frequency of adverse events. The rates and incidence of severe symptomatic hypoglycemia, defined as hypoglycemia requiring intervention from a third party, were comparable for all treatment regimens (see Table 4). *Entire treatment phase (3 months) has been included. **Last three months of treatment have been considered. Continuous Subcutaneous Insulin Infusion (CSII) (Type 1 Diabetes): The rates of catheter occlusions and infusion site reactions were similar for APIDRA and insulin aspart (see Table 5). Hypoglycemia may occur as a result of an excess of insulin relative to food intake, energy expenditure, or both. Mild/Moderate episodes of hypoglycemia usually can be treated with oral glucose. Adjustments in drug dosage, meal patterns, or exercise may be needed. Severe episodes with coma, seizure, or neurologic impairment may be treated with intramuscular/subcutaneous glucagon or concentrated intravenous glucose. Sustained carbohydrate intake and observation may be necessary because hypoglycemia may recur after apparent clinical recovery. APIDRA is a recombinant insulin analog that has been shown to be equipotent to human insulin. One unit of APIDRA has the same glucose-lowering effect as one unit of regular human insulin. After subcutaneous administration, it has a more rapid onset and shorter duration of action. APIDRA should be given within 15 minutes before a meal or within 20 minutes after starting a meal. APIDRA is intended for subcutaneous administration and for use by external infusion pump. The dosage of APIDRA should be individualized and determined based on the physician's advice in accordance with the needs of the patient. APIDRA should normally be used in regimens that include a longer-acting insulin or basal insulin analog. APIDRA should be administered by subcutaneous injection in the abdominal wall, the thigh or the deltoid or by continuous subcutaneous infusion in the abdominal wall. As with all insulins, injection sites and infusion sites within an injection area (abdomen, thigh or deltoid) should be rotated from one injection to the next. As for all insulins, the rate of absorption, and consequently the onset and duration of action, may be affected by injection site, exercise and other variables. Blood glucose monitoring is recommended for all patients with diabetes. Parenteral drug products should be inspected visually prior to administration whenever the solution and the container permit. APIDRA must only be used if the solution is clear and colorless with no particles visible. When it is used in a pump, APIDRA should not be mixed with other insulins or with a diluent. Unopened APIDRA vials should be stored in a refrigerator, 36°F to 46°F (2°C to 8°C). Protect from light. APIDRA should not be stored in the freezer and it should not be allowed to freeze. Discard vial if frozen. Opened vials, whether or not refrigerated, must be used within 28 days. They must be discarded if not used within 28 days. If refrigeration is not possible, the open vial in use can be kept unrefrigerated for up to 28 days away from direct heat and light, as long as the temperature is not greater than 77°F (25°C). Infusion sets (reservoirs, tubing, and catheters) and the APIDRA in the reservoir should be discarded after no more than 48 hours of use or after exposure to temperatures that exceed 98.6°F (37°C). **/* Lantus ® is a registered trademark of Aventis Pharmaceuticals Inc.
**/** The brands listed are the registered trademarks of their respective owners and are not trademarks of Aventis Pharmaceuticals Inc.
Read the Patient Information that comes with APIDRA (uh-PEE-druh) before you start using it and each time you get a refill. There may be new information. This leaflet does not take the place of talking with your healthcare provider about your condition or treatment. If you have questions about APIDRA or about diabetes, talk with your healthcare provider. What is the most important information I should know about APIDRA? Do not change the insulin you are using without talking to your healthcare provider. Any change in insulin strength, manufacturer, type (regular, NPH, analogs), or species (animal, human) may need a change in the dose. This dose change may be needed right away or later on during the first several weeks or months on the new insulin. Doses of oral antidiabetic medicines may also need to change, if your insulin is changed. You must test your blood sugar levels while using an insulin such as APIDRA. Your healthcare provider will tell you how often you should test your blood sugar level, and what to do if it is high or low. When used in a pump do not mix APIDRA with any other insulin or liquid. APIDRA comes as U-100 insulin and contains 100 units of APIDRA. One milliliter (mL) of U-100 insulin contains 100 units of insulin. (1 mL = 1 cc). APIDRA is a rapid-acting man-made insulin that is like insulin made by your body. APIDRA is used to treat adults with diabetes for the control of high blood sugar. APIDRA starts working faster than regular insulin and does not work as long. APIDRA is used with a longer-acting insulin or by itself as insulin pump therapy to maintain proper blood sugar control. You need a prescription to get APIDRA. Always be sure you receive the right insulin from the pharmacy. Who should not take APIDRA? Do not take APIDRA if you are allergic to insulin glulisine or any of the inactive ingredients in APIDRA. See the end of this leaflet for a list of the inactive ingredients. are pregnant or plan to become pregnant. It is not known if APIDRA may harm your unborn baby. It is very important to maintain control of your blood sugar levels during pregnancy. Your healthcare provider will decide which insulin is best for you during your pregnancy. are breast-feeding or plan to breast-feed. It is not known whether APIDRA passes into your milk. Many medicines, including insulin, pass into human milk, and could affect your baby. Talk to your healthcare provider about the best way to feed your baby. See the end of this leaflet for the " Instructions for Use " including the sections " How do I draw the insulin into the syringe? " and " How should I infuse APIDRA with an external subcutaneous insulin infusion pump? " You should take APIDRA within 15 minutes before a meal or within 20 minutes after starting the meal. Only use APIDRA that is clear and colorless. If your APIDRA is cloudy or colored, return it to your pharmacy for a replacement. Inject APIDRA under your skin (subcutaneously) in your upper arm, abdomen (stomach area), or thigh (upper leg). Never inject it into a vein or muscle. If you use a pump, infuse APIDRA through the skin of your abdomen. Always use a syringe that is marked for U-100 insulin. If you use the wrong syringe, you may get the wrong dose. You could get a blood sugar level that is too low or too high. If you are mixing APIDRA with NPH human insulin, draw APIDRA into the syringe first. Inject the mixture right away. Do not mix APIDRA with any other type of insulin than NPH. Do not mix APIDRA with any other insulin when used in a pump. Medicines. Many medicines can affect your insulin needs. Other medicines, including prescription and non-prescription medicines, vitamins and herbal supplements, can change the way insulin works. You may need a different dose of insulin when you are taking certain other medicines. Know all the medicines you take, including prescription and non-prescription medicines, vitamins and herbal supplements. You may want to keep a list of the medicines you take. You can show this list to all your healthcare providers and pharmacists anytime you get a new medicine or refill. They will tell you if your insulin dose needs to be changed. Meals. The amount of food you eat can affect your insulin needs. If you eat less food, skip meals, or eat more food than usual, you may need a different dose of insulin. Talk to your healthcare provider if you change your diet so that you know how to adjust your APIDRA and other insulin doses. Alcohol. Alcohol, including beer and wine, may affect the way APIDRA works and affect your blood sugar levels. Talk to your healthcare provider about drinking alcohol. Travel. If you travel across time zones, talk with your healthcare professional about how to time your injections. When you travel, wear your medical alert identification. Take extra insulin and supplies with you. What are the possible side effects of APIDRA and other insulins? The wrong insulin dose. This can happen when too much insulin is injected. For pump users it could happen if the pump dose is too high. Not enough carbohydrate (sugar or starch) intake. This can happen if: a meal or snack is missed or delayed. Mild to moderate hypoglycemia can be treated by eating or drinking carbohydrates such as fruit juice, raisins, sugar candies, milk or glucose tablets. Talk to your healthcare provider about the amount of carbohydrates you should eat to treat mild to moderate hypoglycemia. Severe hypoglycemia may require the help of another person or emergency medical people. Someone with hypoglycemia who cannot take foods or liquids with sugar by mouth needs medical help fast and will need treatment with a glucagon injection or glucose given intravenously (IV). Without medical help right away, serious reactions or even death could happen. Hyperglycemia occurs when you have too much sugar in your blood. Usually, it means there is not enough insulin to break down the food you eat into energy your body can use. Hyperglycemia can be caused by a fever, an infection, stress, eating more than you should, taking less insulin than prescribed, or it can mean your diabetes is getting worse. -use after the expiration date. For pump users this can also be caused when the bolus dose of APIDRA infusion or the basal infusion is set too low or the pump is delivering too little insulin. Too much carbohydrate intake. This can happen if you eat larger meals, eat more often or increase the amount of carbohydrate in your meals. Testing your blood or urine often will let you know if you have hyperglycemia. If your tests are often high, tell your healthcare provider so your dose of medicine can be changed. Hyperglycemia can be mild or severe. It can progress to diabetic acidosis (DKA) (ketoacidosis) or very high glucose levels (hyperosmolar coma) and result in unconsciousness and death. Diabetic ketoacidosis occurs most often in patients with type 1 diabetes. It can also happen in patients with type 2 diabetes who become very sick. Because some patients get few symptoms of hyperglycemia, it is important to check your blood sugar regularly. These are not all the side effects of APIDRA. Ask your healthcare provider or pharmacist for more information. How should I store APIDRA? Store new unopened APIDRA vials in the refrigerator (not the freezer) between 36°F to 46°F (2°C to 8°C). Do not freeze APIDRA. Keep APIDRA out of direct heat and light. If a vial freezes or overheats, throw it away. Once a vial is opened, you can keep it in the refrigerator or as cool as possible (below 77°F [25°C]), but the opened vial must be used within 28 days. If refrigeration is not possible, the open vial in use can be kept unrefrigerated for up to 28 days away from direct heat and light, as long as the temperature is not greater than 77°F (25°C). For example, do not leave it in a car on a summer day. after exposure to temperatures higher than 98.6°F (37°C). Do not use a vial of APIDRA after the expiration date stamped on the label. Do not use APIDRA if it is cloudy or if you see particles. Use APIDRA only to treat your diabetes. Do not give or share APIDRA with another person, even if they have diabetes also. It may harm them. This leaflet summarizes the most important information about APIDRA. If you would like more information, talk with your healthcare provider. You can ask your healthcare provider or pharmacist for information about APIDRA that is written for health professionals. For more information about APIDRA call 1-800-633-1610 or go to website www.aventis-us.com. Inactive Ingredients: m-cresol, tromethamine, sodium chloride, polysorbate 20, and water for injection. The syringe must be new and not contain any other medicine. Do not mix APIDRA with any other type of insulin than NPH. If you are mixing APIDRA with NPH human insulin, draw APIDRA into the syringe first. Inject the mixture right away. Check the insulin to make sure it is clear and colorless. Do not use it after the expiration date or if it is cloudy or if you see particles. Wipe the top of the vial with an alcohol swab. You do not have to shake the vial of APIDRA before use. Use a new needle and syringe every time you take a dose. Use disposable syringes and needles only once. Throw them away properly. Never share needles and syringes. Before you take the needle out of the vial, check the syringe for air bubbles. If bubbles are in the syringe, hold the syringe straight up and tap the side of the syringe until the bubbles float to the top. Push the bubbles out with the plunger and draw insulin back in until you have the correct dose. If you are mixing APIDRA with NPH insulin check with your healthcare professional on how to mix. How do I inject APIDRA? Inject APIDRA under your skin. Take APIDRA as prescribed by your healthcare provider. You should look at the medicine in the vial. If the medicine is cloudy or has particles in it, do not use it. Contact your healthcare provider. Use a new vial. Use alcohol or soap and water to clean the skin where you are going to inject. The injection site should be dry before you inject. Follow your healthcare provider's instructions for throwing away the needle and syringe. Do not recap the syringe. Used needle and syringe should be placed in sharps containers (such as red biohazard containers), hard plastic containers (such as detergent bottles), or metal containers (such as an empty coffee can). Such containers should be sealed and disposed of properly. How should I infuse APIDRA with an external subcutaneous insulin infusion pump? APIDRA is recommended for use in the following pumps and infusion sets: Disetronic ® H-Tron ® plus V100 and D-Tron ® with Disetronic catheters (Rapid, Rapid C, Rapid D, and Tender); MiniMed ® Models 506, 507, 507c and 508 with MiniMed catheters (Sof-set Ultimate QR, and Quick-set) **/** . Refer to the instruction manual of your specific pump on proper use of insulin in a pump. Call your healthcare provider if you have questions about using the pump. If the pump or infusion set does not work right you may not receive the right dose of insulin. Hypoglycemia, hyperglycemia or ketosis can happen. Problems should be identified and corrected as quickly as possible, see instruction manual for your pump. Because APIDRA starts working faster and does not work as long, you may have less time to identify and correct the problem than with regular insulin. 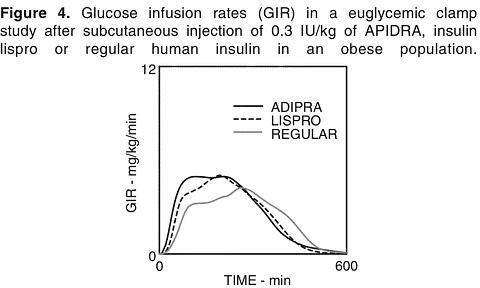 If you start using APIDRA by pump infusion, you may need to adjust your insulin doses. Check with your healthcare provider. a change in the infusion site. If these actions do not work, you may need to restart your injections with syringes and you must call your healthcare provider. Continue to check your blood sugar often. if the insulin has been exposed to temperatures over 98.6°F (37°C). If the insulin or pump could have absorbed radiant heat, for example from sunlight, that would heat the insulin to over 98.6°F (37°C). Dark colored pump cases or sport covers can increase this type of heat. The location where the pump is worn may affect the temperature. Patients who get skin reactions at the infusion site may need to change infusion sites more often. DIABETES FORECAST is a national magazine designed especially for patients with diabetes and their families and is available by subscription from the American Diabetes Association, National Service Center, 1701 N. Beauregard Street, Alexandria, Virginia 22311, 1-800-DIABETES (1-800-342-2383). You may also visit the ADA website at www.diabetes.org. Another publication, DIABETES COUNTDOWN , is available from the Juvenile Diabetes Research Foundation International (JDRF), 120 Wall Street, 19th Floor, New York, New York 10005, 1-800-JDF-CURE (1-800-533-2873). You may also visit the JDRF website at www.jdf.org.